This handy guide to traditional Log Cabin blocks, Half Log Cabin blocks, and Courthouse Steps Log Cabin blocks tucks conveniently into your purse or tote bag. Yardage requirement charts for Log Cabin blocks and quilts. Cutting charts for 6", 8", 10", and 12" Log Cabin blocks. See block variations with color placement, strip size, and more. 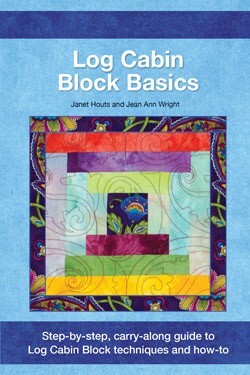 Log Cabin quilt layout and setting instructions.